Trader's from all over Australia attend the Bead Expo, bringing their shiny wares to tempt us all. Beads, gemstones, chain and findings, crystals, pearls, hand blown glass beads just to name a few. And of course, all the accessories you need - thread, needles, tools, bead boards - anything needed to create your finery. 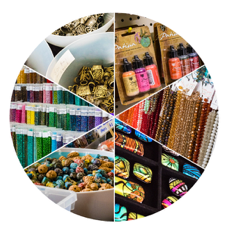 Our 2018 Bead Expo had a multitude of traders attend, and their feedback is always positive - not only do they get to share their love of beading with the general public and our members, they get to see other new products that someone else may stock. Visit our traders below if you can't wait until the next Bead Expo!